Maximum voltage rating for all intended applications is 300 volts. Carol 12 AWG/2 Conductors underground low energy circuit cable, 150 Volts, sunlight resistant for low voltage lighting, mainly used for low voltage landscape or securing lighting. The safe and easy way to hide cords on the floor. Corduct cord protector conceals wires and cords while creating a smooth, trip-free surface. Applies to any flooring surface with pressure sensitive tape (included with product). Cuts to any length with scissors or utility knife. 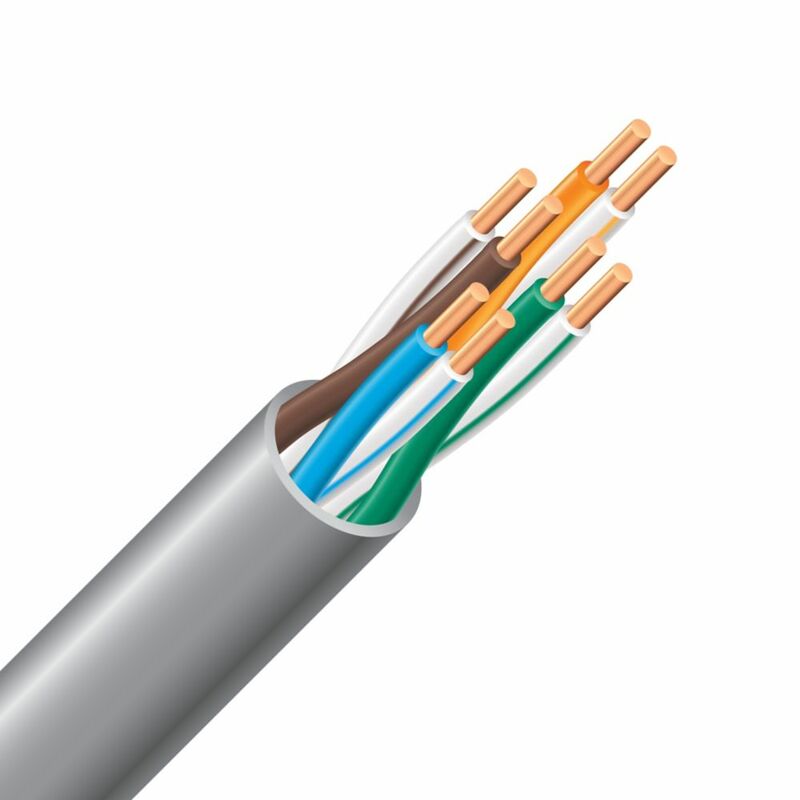 Southwire SIMpull electrical cable with copper electrical wire. 6 AWG stranded wire with 7 strands. Used in raceways (except cable troughs and ventilated flexible cableways), ceiling fixtures, dry or wet locations and open wiring exposed to weather. SIMpull RW90 features Southwires NoLube SIM technology which has revolutionized the way wire is pulled into conduit It reduces installation time by an average of 30 percent in independent testing, and enables you to pull cable within allowable tension limits without applying pulling lubricant, saving you time and money. SIMpull RW90 copper electrical wire pulls 50% easier, is tear resistant, reduces burn-thru and strips easier. CAT 5e Electrical Riser Cable - 24/4 Grey 150m Southwire's 24/4 CAT 5e riser cable can be used in walls and under raised floors for computer network wiring. Features soft annealed copper conductors in 4 twisted pairings with a rip-cord for easy stripping. CAT 5e Electrical Riser Cable - 24/4 Grey 150m is rated 4.0 out of 5 by 43. Rated 5 out of 5 by HomeDepotCustomer from Well packaged. As a test, I connected a POE... Well packaged. As a test, I connected a POE camera through the entire 500ft while still in the box. It worked perfectly. Rated 5 out of 5 by Paul from I wired my home (10 jacks in 7 rooms) many years ago with 4-strand 'phone' cable (cat3) because 1... I wired my home (10 jacks in 7 rooms) many years ago with 4-strand 'phone' cable (cat3) because 100mb data only used four out of the eight wires. And it was significantly cheaper back in those days than cat5. And wireless - in my experience - is not nearly as fast as any ethernet connections. But with gigabit service, 4-strand wires won't work - stuck at 100mb. So I decided it was time to replace the 4-strand cat3 with real 8-strand cat5 cable. And it's really affordable now! What I like the most about this cable is that the colors are bright and easy to distinguish. For example, the blue, green, orange, and brown colors in some other cables are washed out and hard to tell them apart without perfect lighting and some magnification - especially when inserting the wires into an RJ-45 plug. With this cable, perfect cable plugs every time! And the box is a good dispenser - cable comes out 'straight' for the most part unlike off a spool or reel that may tend to coil up. This cable is easy to work with, affordable, and no shipping charges as it was in stock on the shelf. Rated 5 out of 5 by Shavings from The cable installed easily from the box and was operational. The cable installed easily from the box and was operational. Rated 5 out of 5 by Ed from Decent flexibility but with enough rigidity to feed through walls,... Decent flexibility but with enough rigidity to feed through walls, good grade copper (easy to strip/terminate), also compatible with a RJ45 plug - crimps well and the jacket is held tightly.Great for running lines throughout a building. Rated 5 out of 5 by Cowboy from Performed as expected. Performed as expected. Rated 5 out of 5 by Jake from Easy to pull without worrying about tangles. Did my... Easy to pull without worrying about tangles. Did my entire 2 story house with one box!